When we published the first edition of this book, we heard from plenty of people who thought it was a great way to learn SQL Server from scratch. But we also heard from a lot of experienced developers who read it and were amazed to discover how much they didn’t know about SQL. That’s why we’ve dubbed this book "the SQL book that most developers don’t even know they need." Although I have used SQL Server on a daily basis for over 15 years, I was amazed at the number of new things that I learned while reading this book. I used a couple of the ideas to create a noticeable improvement in response time for one of my client/server projects." In this section, you’ll learn the concepts and terms you need for working with any database. You’ll also learn how to use Microsoft SQL Server 2016 and the Management Studio to run SQL statements on your own PC. In this section, you’ll learn all the skills for retrieving data from a database and for adding, updating, and deleting that data. These skills move from the simple to the complex so you won’t have any trouble if you’re a SQL novice. And they present skills like using outer joins, summary queries, and subqueries that will raise your SQL expertise if you already have SQL experience. In this section, you’ll learn how to design a database and how to implement that design by using either SQL statements or the Management Studio. When you’re done, you’ll be able to design and implement your own databases. But even if you’re never called upon to do that, this section will give you the perspective that will make you a better SQL programmer. In this section, you’ll learn the skills for working with database features like views, scripts, stored procedures, functions, triggers, cursors, and transactions. You’ll also learn how to manage database security, and you’ll learn how to use the features for working with XML and BLOB data. These are the features that give a database management system much of its power. Then, this section ends with an introduction to CLR integration, a feature that allows you to create database objects using the C# or Visual Basic language. I think it’s fair to say that most developers don’t know enough about SQL and the database management system they’re using. As one customer put it, "I know just enough about SQL Server to be a little bit dangerous!" That’s why developers often code SQL statements that don’t perform as efficiently as they ought to. That’s why they aren’t able to code some of the queries that they need for their applications. And that’s why they don’t take advantage of all the features that SQL Server has to offer. That’s also why this book should be required reading for every application programmer who uses SQL Server. This book is also the right first book for anyone who wants to become a database administrator. Although this book doesn’t present all of the skills that are needed by a DBA, it will get you started. Once you’ve finished it, you’ll be prepared for more advanced books on the subject. SQL is a standard language for accessing database data. So most of the SQL code in this book will work with any database management system. As a result, once you use this book to learn how to use SQL to work with a SQL Server database, you can transfer most of what you have learned to another DBMS such as Oracle, DB2, or MySQL. Although you will progress through this book more quickly if you have some development experience, everything you need to know about databases and SQL is presented in this book. As a result, you don’t need to have any programming background to use this book to learn SQL. SQL Server 2016 won’t install on Windows 7 or earlier. So you need to have a later operating system to practice with the book examples or to do the chapter exercises. In appendix A in the book, you’ll find complete instructions for installing these items on your PC. And in chapter 2, you’ll learn how to use them. To work with the application code shown in chapter 19, on BLOBs, you can use an Express Edition of Visual C# or Visual Basic. These products are also available from Microsoft’s website for free. "Looking to get started with SQL Server? This is a fantastic place to start. Looking for a solid reference as you polish your SQL? Grab a copy." "The Perfect Book for Application Programmers: If you’re new to using SQL Server in your applications, this book will save you a lot of time. It teaches you about SQL, database design, a lot about admin (which many developers have to do; not everywhere has dedicated DBAs), and the advanced SQL is excellent. Highly recommended." "Although I have used SQL Server on a daily basis for over 15 years, I was amazed at the number of new things that I learned while reading this book. I used a couple of the ideas to create a noticeable improvement in response time for one of my client/server projects." "The most positive feature of the book is the simple informative writing. Wow! I think a lot of thought went into this book before they ever wrote a word." "I have recommended this book and others in the series to developers and architects as an outstanding reference for application and database development." "This book exceeds my expectations for books that teach database and software development. 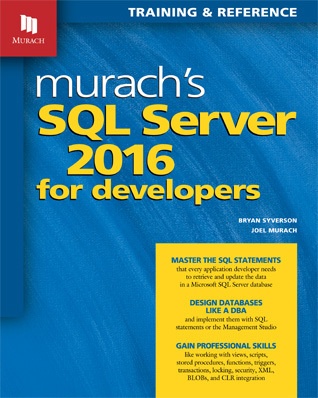 A wonderful book for both learning and mastering SQL Server." After two introductory chapters (not included in this download), chapter 3 shows how to use SQL SELECT statements to retrieve data from a single table. Our hope is that this will give you a better idea of how well our book works and how much there is to learn about SQL. Appendix A in the book describes how to install and use these files. Why won’t SQL Server 2016 Express install on my Windows 7 computer? SQL Server 2016 Express requires Windows 8 or later as the operating system. Why do I get an error about a version mismatch when I try to attach the databases for this book? This error occurs when you have an older version of SQL Server (besides the 2016 version) installed on your system. Often, you aren’t even aware that this older version is on your system because the software was installed as part of another product, such as Visual Studio. To solve this problem, you can use the SQL Server Configuration Manager to view the instances of SQL Server that are running on your computer. This lets you view their names. Then, you can use the SQL Server Management Studio to connect to the correct instance. After you connect, you can make sure you are connected to the correct version by viewing the version number of the server in the Object Explorer window.